As parents, and now grandparents, Letty and I have had the honor of teaching our kids how to pray. The best times of prayer come at night as we thank God for the day and ask for His protection over us as we sleep. 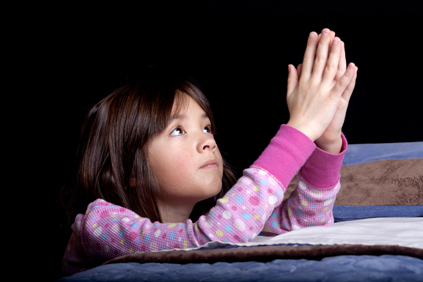 Every now and then the kids get a little flippant or trite in their prayers to God. When that happens I’ll interrupt them and say something like, “Remember WHO you are talking with.” And they’ll stop their prayer, understand what I said, and proceed; this time with a little more serious tone to their prayer. Now I know that kids will be kids, and I don’t want to be overbearing with them. I certainly don’t want them to lose the joy of praying to God who loves them and meets them just as they are. But I do want them to know that the One they are talking with is LORD God Almighty. Yes, He is also their Best Friend and the Lover of their souls. But He is also the One who sets the stars in the sky, who makes the mountains quake and the oceans roar. In reflection, I also realized how easy it is for me to be trite and flippant in my own conversations with God. We all need to be reminded Who we are talking with when we pray. And this is the One I am about to ask for help to get my lost prescription filled? This is the Person I am asking to bless me so that I have a good attitude during a meeting? I dare to come before such Holiness and request some financial help so we can make it to the end of the month? When we reflect on the true dynamics of prayer (that the most profane dare to ask the Most Holy for a favor) it seems ridiculous, if not absurd and ludicrous. And yet the Holy One would not have it any other way! He looks beyond the issues of propriety and protocol (made possible by the sacrifice of His Son) and has pity and mercy on us. He does meet us right where we live. He sees us with pure eyes of love. He hears us and He responds – every time for our good. And that makes Him even more Holy to me. And it makes me love Him more, and trust Him more, and be in awe-filled worship of Him even more. And it makes me want to be like Him. As we pray, let us become more aware of Who we are talking with. To Whom we pray is surely more important that what we pray for. That is the Whole Life Worship perspective. I will save this one ! Great reminder of God caring about the details of my life. I needed that. Thanks Doug. This perspective of God is beautiful. Thank you!